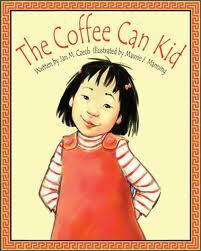 Jan M. Czech’s story of international adoption – The Coffee Can Kid - is illuminated by Maurie J. Manning’s large, bright illustrations. This book does show the importance of pre-adoption history. Annie knows her birth name and its meaning, and a bit of how she came to live with her parents. She knows she can look at her pictures whenever she wants. The book shows that it’s OK to ask questions, even if your parent doesn’t know the answers. My concerns with the book are the circumstances of Annie’s adoption. Her birth mother is portrayed as choosing adoption because of financial issues. Annie’s parents had money. Annie never asks why they didn’t just give the birth mother money. The issue of openness is never broached; Annie never asks why there is no contact between her birth mother and her American mom and dad. The book falls short of perfection, but it still encourages open communication between adoptive parents and adoptees. And that’s an important start. Find this site helpful? Why not "sit in the front row?" Join up in the upper-right-hand corner! Hi Vicki! Thanks, and welcome! I'm glad you're here!